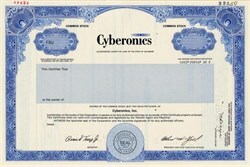 Beautiful engraved specimen certificate from the Cyberonics Company . This historic document was printed by United States Bank Note Company and has an ornate border around it with a vignette of the company logo. This item has the printed signatures of the Company's President and Secretary. Cyberonics manufactures one product, the VNS Therapy System. The VNS Therapy System was approved by the FDA on July 16, 1997 for use as an adjunctive therapy in reducing the frequency of seizures in adults and adolescents over 12 years of age with partial seizures which are refractory to antiepileptic medications. Cyberonics, Inc. (NASDAQ: CYBX) pioneered the Vagus Nerve Stimulation (VNS Therapy�) System. Founded in 1987 to design, develop and market implantable medical devices for the treatment of epilepsy and other debilitating neurological disorders, Cyberonics has emerged as a leader in the neuromodulation industry. The VNS Therapy System uses a surgically implanted medical device that delivers electrical pulsed signals to the vagus nerve in the left side of the neck. This therapy has proven effective in significantly reducing the number and/or intensity of seizures in many people suffering from epilepsy and has the potential for use in the treatment of other inadequately treated, chronic disorders. In 1997, Cyberonics received approval from the Food and Drug Administration (FDA) to market VNS Therapy for the treatment of epilepsy. Since that time, more than 32,000 patients worldwide have been implanted with the device. These patients have accumulated in excess of 100,000 patient years of experience using this life-enhancing therapy. The remarkable success of VNS Therapy in the treatment of epilepsy has served as a platform for continued innovation. On July 15, 2005 , after seven years of extensive study and clinical trials, VNS Therapy was approved by the FDA as a long-term adjunctive treatment for treatment-resistant depression. It is also at various levels of study as a potential treatment for other chronic disorders, including anxiety, Alzheimer�s, bulimia, and migraine headaches. Headquartered in Houston , Texas , Cyberonics has additional offices in Brussels , Belgium . The Company markets the VNS Therapy system in selected markets worldwide. History from Company press information and OldCompanyResearch.com (old stock certificate research service).